Just added to the Notes page a few pages about option pricing on trees. We explicitly show the equivalence of replicating, hedging or using a risk-neutral approach to price options on a binomial tree. A Mathematica implementation of binomial and trinomial tree will be added soon, with discussion on convergence issues. Easily compute price and greeks of european-style option derivatives. 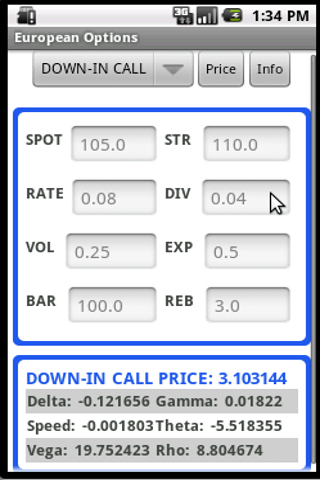 European Options is an handy app to compute price and greeks of Vanilla, Digital and Barrier european-style options (for definitions we refer to the standard book “Hull – Options, futures and other derivatives”). It is planned to add more exotic options. Price and greeks are computed via analytical formulas. The source code is available at my GitHub repo.